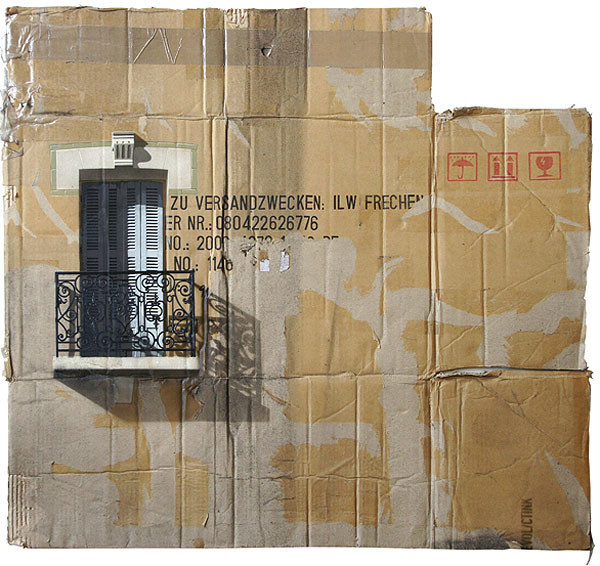 Berlin-based artist Evol – known best for his street art interventions of scale models of abandoned and decaying buildings left on electrical boxes and cement blocks in cities around the world – currently has his first solo show in the United States at the Jonathan LeVine Gallery in Chelsea. Repeat Offender, as the exhibition is titled, is a collection of Evol’s recent work of multi-layered stencil paintings on used and flattened cardboard boxes, as well as other paintings on scrap metal. 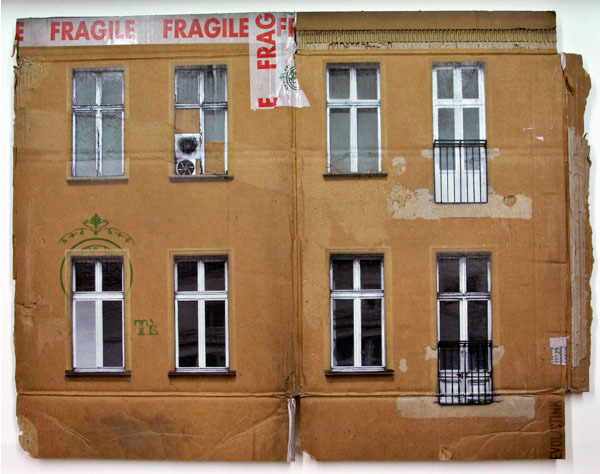 These works continue to convey general urban decay and, more specifically, the walls and façades of pre-gentrified East Berlin. Incredibly realistic (I thought they were photo-silkscreened), these spray-painted pieces work beautifully on their chosen canvases. The combination of the painted façades with the type, tape, and icons on the original boxes gives them a wonderful texture. Though they photograph well, seeing these in person, as with most art, adds another dimension. Repeat Offender will be at the Jonathan LeVine Gallery through this Saturday, May 5th. You can watch a video of Evol’s process here. Photos courtesy Jonathan LeVine Gallery. This entry was posted in Architecture, Art, Event, NYC, Pop Culture, Street Art, Stuff We Like. Bookmark the permalink.